Writing a good post can take some time, you need to do some research or prepare something on your own knowledge, it requires time and work, you might know by now how to write new content for your site. Should help your audience to solve a problem or to learn something on your niche. You need to write for your audience, and they need to feel that you wrote that particular post for them. Your site will be full with interesting information on your niche and for your audience, but as millions and millions of people visit the internet every day, you need to learn how to make your audience find your website, in one word, make it easy for them to find you! This is a strategy that will helps you to get your website from a ghost town to a successful online business, the more traffic you get on your website, more clients you can make. A business, off or online needs clients to make money from it, and if you’re here; it’s because your interested to make money online. There are a few things you need to work on to get your content to your audience, easy steps to follow and you’ll open your front door of your business for your clients. 1. Add it to your Google+ account. 2. Add your new blog post to Search Console. Just a few people talk about this way to open the doors for your new content, but at Wealthy Affiliate all members are lucky to have the best training to help us to write and share our websites content faster on Google. There’s a full training on how to add your new content to Google Search console at Wealthy Affiliate for Premium members only. If you’re interested to learn how to make money on the internet you can sign up today for your 10 lessons FREE course, and if you like what you see you could sign up for Premium membership to get the best online training to build up your online business. There are a few more things you can do to help your client to find you and your online business. As Pinterest has become one of the best ways to get your content to your client, you might have already your own account, if you haven’t, I will explain why Pinterest can helps you to get tons of traffic to your website. When you sign in on Pinterest you can type anything you want to look at it on the search window, and Pinterest will display some of the best pins to look for, you’ll find faster what you’re looking for on this Social Media. When you create a Pinterest account, you can add as many pins from your website or blog to it, be sure to add the keywords for every pin you add to your boards. Pinterest has become one of the most used media to search anything on the internet, it works quite well and it’s faster. Everytime you write a new blog post, you can create some images for it on Canva, or photoshop, it’s a good tip not to create just one image to share on Pinterest, but create more than 2, some successful bloggers advice to create up to 6. Add a different message related to your post with different images, the reason to do this is simple: people like to look at variety, people do not like to see the same message over and over again. Another good reason to do this is Pinterest boards have rules, and one of those rules is you won’t be allowed to share the same pin for at least every 30 days, that can slow down the traffic for your online business. But if you take the time to create more than 2 different pins for your new blog post, you’ll have some different pins to share on Pinterest groups and you’ll get more traffic to your website or blog. 2. Share your post on Social Media. As soon as you hit the publish button you need to share your new post on Social Media! Let your client know you have some new information or product for them. They are already looking for it. Should you share your new post to all Social Media? You need to get to know your client first, and then you’ll know what Social Media your client uses, then use that Social Media to share your new post. It won’t be good if you share your website or blog content on Facebook if your client never use it, one of the things to know about your client is what kind of Social Media do they use. Then … get an account for your online business on that particular Social Media. 3. Share your new post to groups and communities. Some Social Media have groups where you can sign up and be part of it, the good point about these groups is most of them have already a niche to be in, or an interest. When you know your niche, and you write content for it, you’ll sign up for some groups where you can share your content. Just don’t forget never be spammy, add valuable information to the group and always be helpful, other members will know you more and more and they will visit your website. Business will happen on your website, this is why you need traffic to it. Take the time to check SEO of your new post again, check if all keywords are working good for your website or if you need to add some, or change them for better keywords. Be sure your keywork is on the title, first and last paragraph, image and headings. If you’re a newbie to blogging and you want to learn more about SEO, you can sign up to Wealthy Affiliate FREE 10 lesson course and learn more about it, you just need to click on the image above and it will take you to the training. SEO lesson has a 13-min video you can watch for FREE. A website or blog content can get more traffic if you create another type of content for it, but don’t get scared by it, when I say you need to create another type of content I don’t mean you need to write a different post for it. Remember what I say on point 1 that people like to see variety, the same happens for your post. If you like this blog post because it helps you to work better and get more traffic to your website, you might want to share it, in a way to thank me or to help your clients and friend so they can also read this information. But you can’t share the full content of it on your website or on Social Media. But if you find an image on this post that will help other to find my website to read this article, I guess you’ll share it on your blog or on your Social Media. At Wealthy Affiliate there’s a video where Jay shares a few ways you can re purpose your content for additional traffic, he will explain to you the steps he follows to create more than one way to share his website content to get additional traffic to his site. This webinar is for Premium members only, you need to sign up for your FREE membership and if you like what you see you can upgrade your membership to Premium, you can read more about Premium membership here and why it can helps you to grow your online business. Most of the people who visit your website will never leave a comment, and you might be one of them, I would love if you take your time to leave a comment below and tell me in a few words what do you think of this blog post, has it helps you to get more ideas to get more traffic to your website? What idea listed here will be easier for you to work first? Would you need more help to work for the second time on the SEO of your blog post? One main reason to respond to comments as soon as you get them on your website is because Google pays attention on everything you do on it. As soon as you respond to a new comment, Google will know you care about your clients and you give them the best attention. But another good reason to put your attention on getting comments on your website and respond to them is because comments add content to your website. Your content will get more words count for Google, your clients like your content and you’re giving them the best of you as a business owner, and Google will know it. The happier Google be with your website, you’ll get more traffic to it! 7. Create a blog post that can be extended on future posts. People love to watch series on TV, I bet you have one or two favorite series you remember you couldn’t wait for the next episode to watch, you just wanted to know more every time. Same happens on your website, if one day I write a good blog post about how to make money on the internet, and I give you the whole information on it, you will visit my website just one time, you get everything that day and you won’t come back ever again. But If I create a few blog post to share good information about how to create an online business and I give you important information on every blog post, you’ll be want I write the next article to read. Have you seen some bloggers tell you on their Facebook page they have a series of 5 videos to tell you more about how to create an online business and work from anywhere. 4th video will be how to share your content on Social Media and get tons of traffic to your website. 5th video will be about how to set up the newsletter and grow your email list. You will be busy creating all that content, but I’m sure your client will love it and they will not only visit your website one day and never come back to it, they will be visiting your website to read more from you. I made the example about how a blogger would create some content for a blog on the make money online niche, but it doesn’t matter what is your niche, you can create a series of blog post that your client will love on any niche. Here’s another good example on how you can create a series of blog post or training for your website, this is taken from Wealthy Affiliate Friday night weekly training with Jay Neil. As you can see Jay created a few training to helps you to create your own YouTube account and grow it to get more traffic to your website. You might want to sign up to watch the first webinar, then he will offer you to come back next Friday to listen second video and third video on week 3, and it will keep going. I guess you might get interested on how YouTube can helps you to grow your online business. This series of webinars is open for all Wealthy Affiliate Premium members, weekly webinars help each member to understand, learn and grow every day their websites and online business. 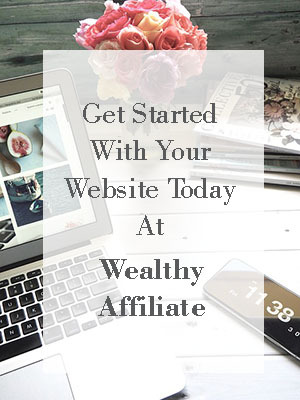 If you’re ready to create your Free membership at Wealthy Affiliate you can sign up here. If you like what you see and learn; then you can sign up to Premium membership ($49 US dollars) and watch all the webinars for no extra cost. Whether you sign to Wealthy Affiliate, I’m happy to share with you what I learn there so you can follow these steps to grow your online business. If you have any question about this article or about Wealthy Affiliate leave a comment and I will replay to you shortly.